Expressionist dance or ausdruckstanz as it was called in Germany, was a movement that arose around 1900 as a reaction to classical ballet. The new dance form aimed for greater freedom of expression and movement and was improvisational, with the dancer often being the choreographer. It eschewed the rigorous pointe work of conventional ballet. 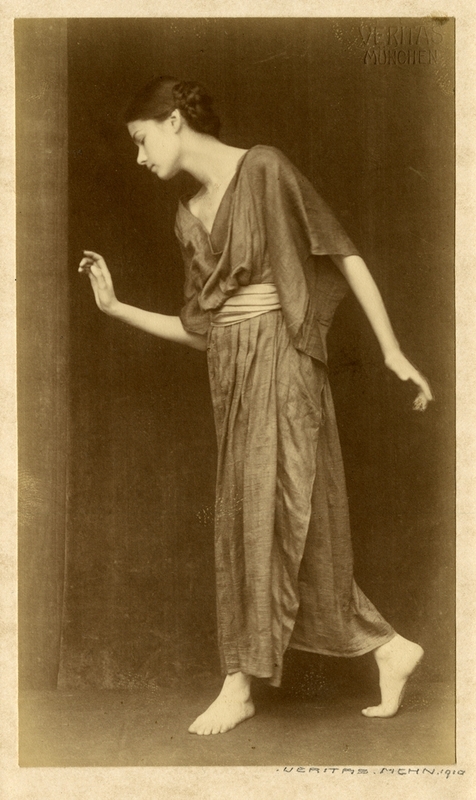 This platinum print of an unidentified dancer was taken by Stephanie Ludwig in 1910. Little is known of Ludwig’s career. She came from a family that owned a photographic business and she opened Veritas, her own studio, at 22 Lindwurm Strasse in Munich. It is likely she would have made her main income from portraiture. She had a striking portrait of a young woman reproduced in Die Kunst in der Photographie, an influential German journal showcasing art photography from around the world. But Ludwig also had a more-than-passing interest in expressionist dance. In addition to the three images of this young dancer in the Grainger collection, the New York Public Library hold a series of photographs by Ludwig of the famous American dancer, Ruth St Denis. Little is documented of Stephanie Ludwig’s life except that she was married to the respected poet and head Librarian of the city of Munich, Hans Ludwig Held (1885-1954). Unfortunately, this relationship did not save her from the Nazis. Stephanie Ludwig, born Stephanie Pauline Edelstein, died on the 16 January 1943 in the Theresienstadt concentration camp in Czechoslovakia.